Calabash Nebula, more famously known as the Rotten Egg Nebula, is a bipolar protoplanetary nebula located in the constellation Puppis. The nebula lies at an approximate distance of 4,200 light years from Earth. Its official designation is OH 231.8+4.2. 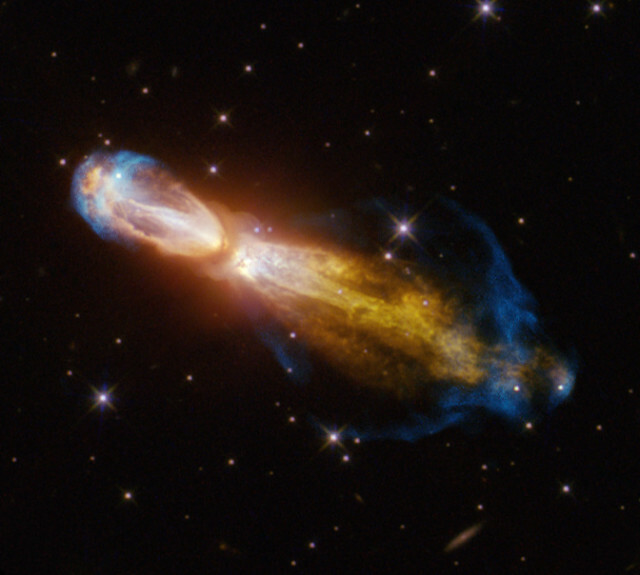 The Calabash Nebula is about 1.4 light years long and has a radius of 0.7 light years. With an apparent magnitude of 9.47, it can only be seen in telescopes. Astronomers have predicted that, in about 1,000 years, the Calabash Nebula will transform into a full-fledged planetary nebula. The nebula lies in the bright, large open star cluster Messier 46. It is uncertain whether it is interacting with any of the stars in the cluster. 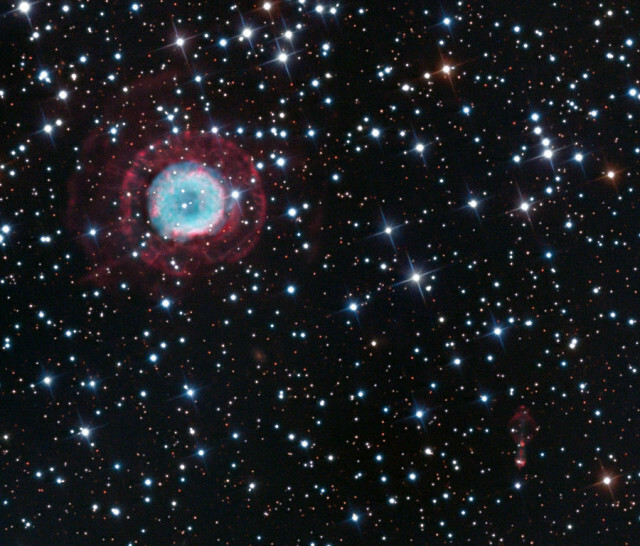 There is another nebula lying in the direction of M46, the planetary nebula NGC 2438, which is also likely unrelated to the cluster and merely lies in the same line of sight. 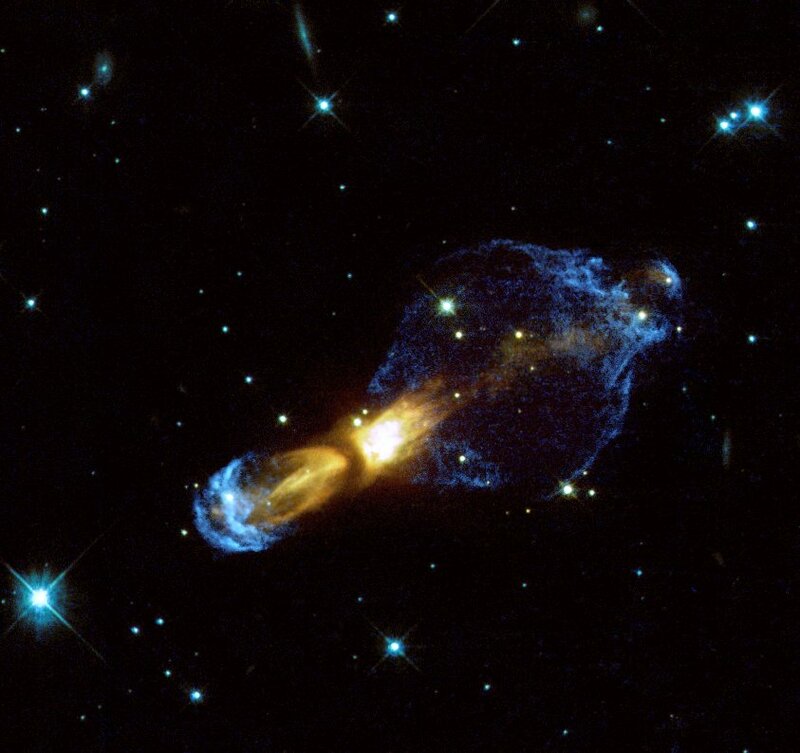 The densest parts of the Calabash Nebula are made up of material expelled by the central star and accelerated in opposite directions at speeds of up to 1.5 million kilometres per hour. The gas now forms bipolar structures which contain the most of what used to be the dying star’s mass. The star has expelled so much gas that it can’t be seen directly anymore, only its starlight is visible as it reflects off the nearby clouds. As a result of the gas travelling at such high speeds, shock fronts are formed, and they heat up the gases around the star. The existence of shock fronts had been predicted by astronomers, but they were theoretical, not proven by previous observations or imaged this clearly. The hottest parts of the surrounding gas heated by the shocks form an intricate double-bubble shape. The gas flow we see now is believed to have resulted from a sudden acceleration some 800 years ago. The fast-moving gas clouds are collimated into streamers on one side and a jet on the other. The Calabash Nebula will help astronomers gain a better understanding of how spherical stars produce planetary nebulae that are highly aspherical in shape. Astronomers have so far proposed theories involving a binary companion or a massive planet and an accretion disk. The nebula’s peculiar shape earned it the name Calabash, and it was nicknamed the Rotten Egg Nebula because it has a large amount of sulphur, which can smell like a rotten egg when combined with other elements. Radio astronomers have discovered many molecules containing sulphur, including sulphur dioxide and hydrogen sulphide, in the gas clouds around the dying central star. The compounds are likely produced as a result of shock waves passing through the clouds of gas. Like planetary nebulae, protoplanetary nebulae have nothing to do with planets. The term planetary nebula was originally used by William Herschel in the 1780s, who thought the objects looked like the planets Uranus and Neptune when observed in telescopes, and the term has stayed in use. Protoplanetary nebulae, sometimes also called preplanetary nebulae, are relatively short-lived and provide astronomers with a rare insight into the formation of planetary nebulae. 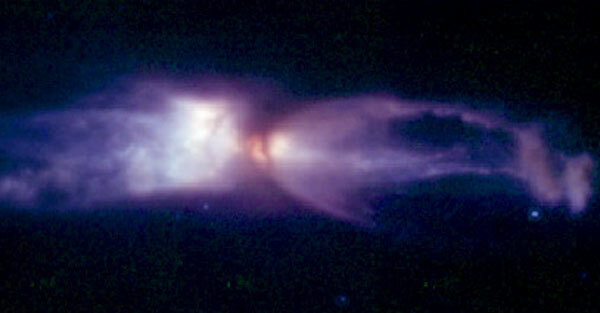 Protoplanetary nebulae like the Calabash are formed from material ejected by an old central star with a mass comparable to that of the Sun, which takes a long time to reach the end of its life cycle. Most stars similar to the Sun go through this phase before becoming planetary nebulae. After staying on the main sequence for billions of years, the star begins to run out of its supply of hydrogen fuel, expands to a great size to become a red giant, and eventually collapses on itself. As a result, the temperature in the star’s core increases and most of the star’s material is shed and expelled into space. The material forms the clouds of gas around the star, whose core has not yet heated to a temperature sufficient to illuminate the surrounding gas clouds, so the clouds are only reflecting the star’s light. Once the star becomes hot enough to emit strong ultraviolet light to illuminate the clouds of ejected material, the clouds become a fully developed planetary nebula. In the meantime, the strong winds of material expelled by the star continue to shape the surrounding clouds into different patterns.